"Want to better understand why we have a federal deficit? In 1952, the corporate income tax accounted for 33 percent of all federal tax revenue. Today, despite record-breaking profits, corporate taxes bring in less than 9 percent. It’s time for real tax reform." PolitiFact recognized that the Senator had not mentioned the growth of pass-through businesses, which are businesses that pass profits through to owners who then report the profits on their individual tax returns. There’s more to this story. Pass-through businesses are subject to just one layer of tax, the individual income tax, while C corporations face double taxation due to the corporate tax and shareholder taxes on dividends and capital gains. The U.S. corporate tax rate is the highest in the developed world, at 39 percent including state corporate taxes. Pass-through businesses have grown dramatically such that more than 90 percent of U.S. businesses are pass-through entities, mainly S corporations, partnerships and sole proprietorships. 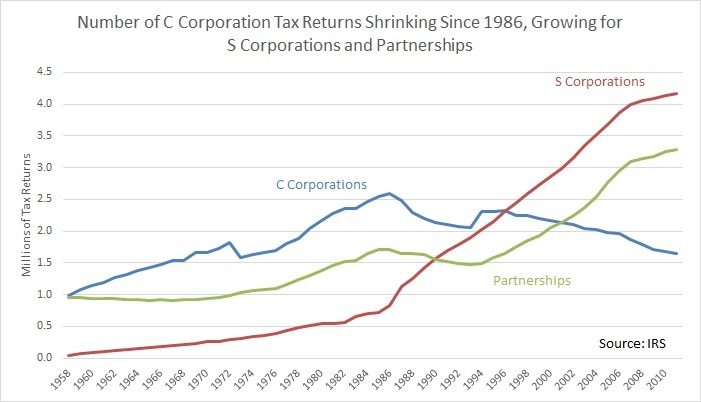 The first chart below shows that while the number of pass-through businesses has been growing, the number of C corporations has been shrinking over the last 27 years. The Tax Reform Act of 1986 reduced the corporate tax rate, but reduced the individual tax rate further, and raised taxes on corporations in other ways. That marked the peak of U.S. C corporations, at 2.6 million in 1986. As of 2011 (most recent data), there are now 1 million fewer corporations, at 1.6 million. In contrast, S corporations grew from about 800 thousand in 1986 to 4.2 million in 2011, and partnerships grew from 1.7 million to 3.3 million. Not shown are sole proprietorships, which are by far the most numerous at about 23 million in 2011, and which have grown at about the same pace as other pass-through businesses, but do not represent a viable alternative to the C corporation form. Also not shown are real estate investment trusts (REITs), which have recently become a popular way for C corporations to spin off assets, but as yet there are less than 20 thousand of these firms. In other words, corporate inversions are only the tip of the iceberg in terms of businesses fleeing the U.S. corporate tax. The share of U.S. business profits attributable to pass-through businesses has grown dramatically as well, as they now represent more than 60 percent of all U.S. business profits. 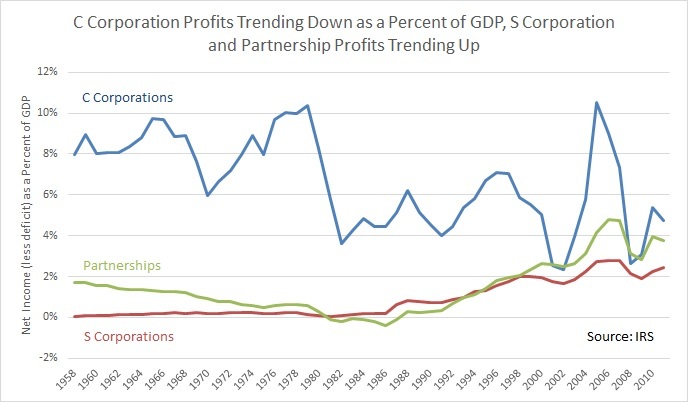 The second chart below shows that C corporation profits, while extremely volatile, have generally trended downward in recent decades, while the profits of S corporations and partnerships have trended upwards. In the 1960s and 1970s, C corporation profits were about 8 percent of GDP, while partnership profits were about 1 percent and S corporation profits were virtually nil. Now C corporation profits hover around 4 percent of GDP (4.7 percent in 2011), while partnership profits are almost at the same level (3.7 percent in 2011) and S corporation profits are not far behind (2.4 percent in 2011). Partnership and S corporation profits are growing such that they will each exceed C corporation profits in the near future if not already. When commentators claim that “corporate profits are at an all-time high”, they are referring to Bureau of Economic Analysis data that combines C corporations and pass-through businesses, whether they know it or not. In sum, the Senator’s statement is flat out false. It is completely misleading to claim that corporate profits are up while corporate tax revenues are down, essentially implying there is some mischief going on via "loopholes", etc. The truth is corporate tax revenue has been falling for decades because the corporate sector has been shrinking, and not just by corporate inversions. The most likely culprit is our extremely uncompetitive corporate tax regime.